harlequin ducks have a buoyant, compact body, with strong webbed feet, which give the duck the power to swim through torrent waters. They are expert swimmers. When they fly, their wings beat rapidly. The harlequin duck weighs 1 to 1.5 pounds and is about 1 to 1.5 feet long. Its wing span is 2 to 2.3 feet in width. The harlequin duck reaches sexual maturity at two years old. It breeds during May-August. The female duck lays anywhere from 5 to 7 yellowish colored eggs. She sits on the eggs for 27 to 29 days and covers the eggs with down, when she's away from the nest. The chicks hatch within a few hours of one another and are able to swim and feed soon after they are hatched. The ducks like to nests by fast flowing rivers, by the edge of the water. Their nests are well hidden and are made from a hollow lined with grass and down. Young chicks fledge (get their feathers) after 35-42 days. The male duck stays with the female until she is finished incubating. They live in flocks of up to 50 in the Atlantic and in larger groups in the Pacific, except when breeding. They are sociable birds. They don't often mix with ducks of other species. Feathers keep the ducks warm and allows them to fly. Feathers are not living so they don't need blood vessels, nerves and other living tissue. They are made of a tough, flexible material and called keratin. There are six different kinds of feathers, such as contour, down, afterfeathers, filoplumes and bristle. The harlequin duck does not have feathers on its beak or feet. The ducks have an oil gland near base of their tail. They use their beak or tail to spread this oil through their feathers to make them waterproof and shiny. When feathers get hurt they do not heal. Ducks molt (loose old feathers and grow new) about 3 times a years. Molting can take up to two months. Harlequin ducks loose all their feathers at once. During breeding, the female duck looses most of her feathers on the lower breast, exposing the skin where it touches the eggs during incubation. The heat from her body helps keep the eggs warm. Feathers help the birds to fly and they also give the wing a shape. A harlequin ducks diet consists of mussels, shellfish, aquatic insects, crustaceans and some small fish. They feed in tight- packed flocks and drive into water 3 or 4 meters deep and within 15 to 25 seconds of diving they have their prey. During the summer months they he at insect larvae found in shallower waters. The harlequin duck is a prey to the arctic fox and to the gray wolf. 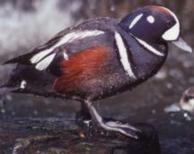 Harlequin duck are not an endangered species. Their lifespan is unknown . Boyer, Trevor, and Gooders, John, Ducks of North America and the Northern Hemisphere. Singapore: Dragon;s World Ltd., 1986. "Harlequin Duck", Wildlife Explorer, International Masters Publishers AB, USA. Patent, Dorothy H. Feathers. Dutton/New York: Cobblehill Books, 1992.